"The pigeon flies at midnight..."
Two teams of Spies must avoid detection by as they try to be the first to locate their Informants, exchange their Challenge Phrases, and return two of their Encrypted Diskettes to their Handler. Spies wear no distinguishing markers, and can only be identified by their suspicious actions. 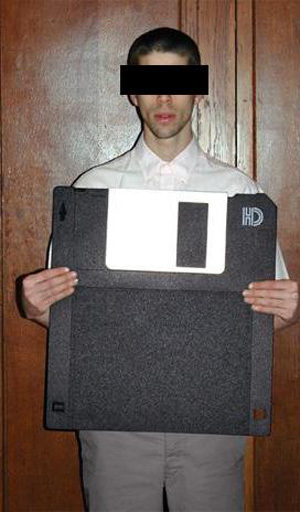 Also, it doesn't help that the Diskettes they must recover are gigantic and neon-colored. Stealth, cunning, drama, disguise, and suspense will abound in SMERSH! Michael T. Astolfi is a game designer, writer, improviser, voice actor, and all-around good guy. He holds a B.A. in Evolutionary Psychology from Boston University, and is in pursuit of an M.A. in Game Design and Play Systems from New York University. Recent game designs include SMERSH, Stranger's Coin-Purse, and Time Dominators. His mail currently finds him in Astoria. Nicole Leffel is a full-time student and part-time dragon slayer attending New York University. Majoring in Media, Culture & Communication with a specialization in Technology & Society, she has always had an affinity for all things game-like. Recently, she contributed to the design of SMERSH, Ace Hole!, and Time Dominators. When not at work or school, she can be found curled up with a video game console in her East Village apartment. Charles Brillant is a computer programmer, game designer, and video editor. He is one semester away from completing his B.A. in Computer Science at New York University. Interests include iPhone development, competitive gaming, and deep thought meditation. His current projects include the game Time Dominators and the location-based iPhone app Conquer. Casey Lent is a screenwriter, actor, director, and game designer. He is entering his third year in New York University's Gallatin School of Individualized Study, with a concentration in Media and Technicultural Studies. Currently writing for Reliance Games and Crispy Gamer.